Michael Kors’ Acquisition of Versace: A New Fashion Empire? 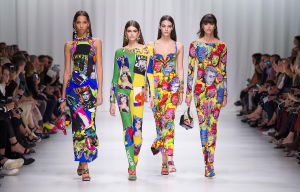 Fashion Editor, Laurie Shelly investigates the latest ‘big buy’ in the fashion industry, and what this will mean for iconic label, Versace. US fashion company Michael Kors Holdings recently announced that it had purchased Italian label Versace for $2.12 billion, and that Michael Kors Holdings was to change its name to Capri Holdings. The move was not totally unprecedented; in July 2017, Kors acquired luxury shoe brand Jimmy Choo for $1.2 billion, and it seemed the designer was beginning to build his own fashion conglomerate, that is, a kind of umbrella company under which numerous brands operate. It was to be expected that further purchases of luxury labels would follow. This, however, could not prevent the chaos that ensued on the internet when those who frequent it learned of the acquisition. The general consensus appeared to be that the legendary Versace brand had just been permanently and tragically lost to an ever-growing cult of tackiness. Many took to Twitter to express their concerns. “Gianni Versace didn’t die for his ICONIC brand to be sold to some cheap & [sic] tacky designer who is the epitome of locals [sic] knowledge on designer brands & [sic] whos [sic] bags u [sic] can’t even tell the difference between the fakes [sic] they sell in turkey [sic], this is the end of Versace. I’m so disappointed,” wrote one impassioned user. This tweet was retweeted many times. I am not sure exactly how many times, and cannot find out as the person that tweeted this tweet has since made their account private – perhaps because they did not want the tweet to be referred to in any more weird articles about the Versace deal, but it was a lot of retweets, like, 150 thousand, and it is very clear the user’s opinion was shared by many. Kors was vilified as the “tackiest man alive.” I don’t know a ton about the guy, but that sounds a tad harsh to me. Founded in 1978, Versace presents customers with interpretations of an ostentatious Italian glamour, with slinky metallic chain-mail dresses, sharp, dramatic cuts and cut-outs, neon, glitziness, Andy Warhol-inspired prints, jewel-encrusted knee-high boots, gold baroque prints… Michael Kors gives us classy, simple, cool, trendy clothes for a jet-set, practical yet stylish customer. In other words, yes, Michael Kors’ designs sometimes tend to be on the less interesting side of things. The gold ‘MK’ stamped on his handbags and wallets is not inherently tackier than the gold Medusa medallions stamped on Versace’s, but the affordability of Michael Kors accessories in comparison to other luxury brands (for the purposes of this piece we are going to call a $150 wallet affordable) has resulted in overexposure and we all know that overexposure is tantamount to death. But everyone need not have worried. Michael Kors is not going to be at the creative helm of the Italian brand. In fact, he is not going to be involved in the designing of Versace collections at all. Donatella Versace will continue to hold the position of creative director, Kors will stick to his eponymous label, and everything will be fine. Fashion conglomerates such as this are nothing new. LVMH Moët Hennessy Louis Vuitton SE and Kering are the two largest luxury fashion conglomerates. The former owns such labels as Louis Vuitton, Berluti, Céline (or Celine, rather, as recently-appointed creative director Hedi Slimane has done away with the accent above the ‘e’ “to enable a simplified and more balanced proportion,” because this is the kind of thing fashion people care about more than diacritical continuity), and the jewel in its crown, Christian Dior, while the latter owns Gucci and Balenciaga among others. One might wonder why Versace decided to be bought and why Kors decided to buy Versace. Well, Capri Holdings says it will get Versace’s revenue up to $2 billion and give it more influence on a global level. 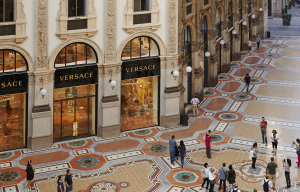 In a press statement Donatella Versace said she believed Versace could now “reach its full potential.” Kors’ label will be boosted by the deal also, thanks to the expertise in producing and marketing luxury apparel Versace can bring to the table, and also with the creation of long-term cost-saving synergies. Both LVMH and Kering are Paris-based. Could Michael Kors Holdings, or Capri Holdings, become the first true American fashion conglomerate? Kors seems to think it could be the next LVMH. Perhaps he sees himself as the next Bernard Arnault (Bernard Arnault is the CEO of LVMH. He is also the fourth richest man in the world). Capri Holdings is a nice little project. I wish Michael Kors the best of luck with it.